Adhering to the long tradition of casting non-action leads in their serials, Republic Pictures hired former 20th Century-Fox light leading man Robert Kent to headline no less than two chapterplays in 1946, King of the Royal Mounted and The Phantom Rider. In the latter, the amiable, good-looking Kent played James Sterling, an earnest young medical doctor attempting to establish an Indian police corps on the Big Tree Reservation. Facing continuing sabotage by unknown forces, the young medico takes up the guise of "Phantom Rider," a mysterious avenger righting the territory's many wrongs. 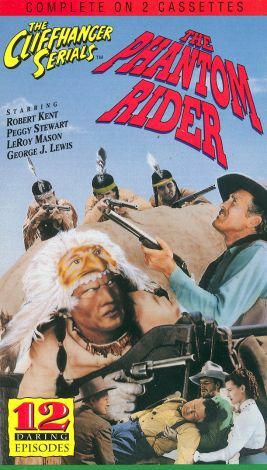 Sterling is secretly opposed by Fred Carson (LeRoy Mason), whose outward friendliness hides a sinister desire to dominate the reservation, but finds loyal allies in Indian friend Blue Feather (George J. Lewis), pretty schoolmarm Doris Shannon (Peggy Stewart), and Nugget (Hal Taliaferro), a tough but lovable miner. Kent, who was doubled by ace Republic stunt-man Dale Van Sickel, headed a superior cast of serial stalwarts that also included Roy Barcroft as a marshal, Tom London, as a henchman, and, in a bit part, future cowboy hero Monte Hale. An edited feature version of the serial was released simultaneously as Ghost Riders of the West.